Aidan, an Irish monk from Iona, founded the monastery of Lindisfarne about 635. It became identified with the Anglo-Saxon ascetic, Cuthbert, who became bishop of Lindisfarne (685). After Cuthbert's death miracles were reported at his grave, leading to the building of a shrine for his relics--and probably the creation of the Lindisfarne Gospels as a commemorative act. With the Viking invasions, the community left Lindisfarne about 875, eventually finding safety at Durham in 995, where a miracle indicated they should found their new monastery. Durham has since then been the sanctuary of St Cuthbert. This manuscript has copies of documents relating to Durham together with histories on Cuthbert's community and church. From a history of the Lindisfarne community, the page begins with the story of Aidan's founding of it. The first letter, 'R', has a picture of a bishop speaking to monks. Probably it represents Lindisfarne's first bishop, St Aidan. 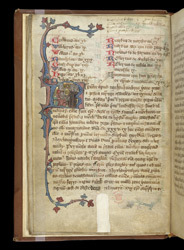 The top of the page has the end of a list of the bishops of Durham, ending with Anthony Beck (1283).